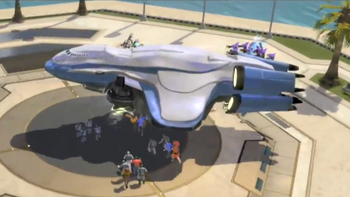 Were you looking for the civilian transport seen in Halo: Reach? This unidentified civilian cargo ship is a type of ship used by humanity in the 2500s. These ships are civilian-operated freighters. The ships are VTOL capable, due to the strong jet thrusters located on their ventral surface. During the Battle for Arcadia in 2531, three of these ships were requisitioned as evacuation transports by the Arcadian Patrol, used to airlift the inhabitants of Pirth City to safety during the battle. Cargo 3 was destroyed by enemy fire, but the other two ships, Cargo 1 and Cargo 2, aided by Spartan Red Team and forces from the UNSC Spirit of Fire, managed to take off and escape, saving hundreds from slaughter by the Covenant. These ships were also used to evacuate civilians from Algolis during the Battle of Algolis. One of them was shot down by the Covenant, but the other, as well as a Pelican, escaped to a frigate in orbit, which was to rendezvous with the UNSC The Heart of Midlothian near the edge of the system. This ship's bow resembles a Boeing 747, a human airliner used in the 20th and 21st centuries on Earth. The general shape and appearance of the UNSC military cargo vessel Dartmouth is similar to the cargo ship, though on a smaller scale. Two of the ships used to evacuate civilians during the Battle of Algolis. One of civilian cargo ships preparing to take off. Detail on the ship as it takes off. The civilian cargo ship lifting off in the midst of battle before it was struck down by Covenant weapons fire. The UNSC Dartmouth, a Naval cargo transport similar to the civilian cargo ship.